Zero Hedge had some fun recently analyzing the extensive thought process that goes into the decision making that leads to the addition (and, more relevantly, subtraction) of any given stock from the Goldman Sachs conviction list. One could say a case study of exhaustive insight and careful risk management it was not.After a flurry of requests, I provide an unabridged, updated snapshot of the entire Goldman Sachs Conviction List (both Buys and Sells) for North American stocks. 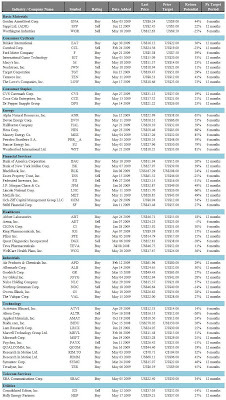 Of course, none of the Goldman stock recommendations are in any way, shape or form endorsed by Zero Hedge (in fact, if one were to put a proverbial gun to the head, one may want to take the second to last column to the right and flip it for a view of what reality 6-12 months from now may actually look like).